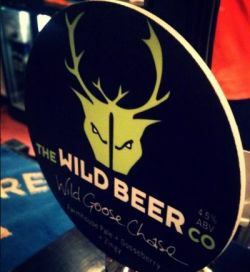 The "all-day" wild beer, tart and fruity, but well-hopped and drinkable. We have been chasing this beer since we started the brewery and love this combination. Juicy, tart gooseberries and our own culture of wild yeast from local orchards give this a gentle acidity. Whilst a generous "dry-hop" of complementary hops enhance the fruitiness and give a light but moreish bitterness. Bottle. Pours a bright gold colour with a thin white head, light hop aroma with some fruit, the taste is medium bitterness and fruity with a dry bitter finish. Bottle. Yellow gold, fluffy and sustaining white head and good persistent condition. Delicate pieapple citrus and an earthy hop sack funkiness in the nose, gentle lemon notes in the mouth, slightly dry with a touch of powdery bitterness, then some pineapple sweetness as it warms, all over a muted base note of grain, finish is muted and dry with a slight fruity citrus note but the initial funkiness is barely apparent. UPDATED: SEP 15, 2018 Bottle. Hazy straw, white head. Funky aroma. Tart tasting, dry, not a lot of gooseberries, refreshing. Less acid than I’d feared. Not bad at all. Bottle from pivny Raj. Aroma: tarty, citrus, slightly herbal. Medium white head (falling really fast), hazy yellow color, light body, thicker, high carbonation. Taste: tarty, citrus, acidic, long lasting bitterness in the end. Good refreshing wild ale. Keg, Brewdog Edinburgh. Pale, acidic nose, bubbly head. Taste is sour without too much herbal or vegetal notes. It's just lacking flavour and depth for me. Ended up blending it with a NEIPA to tone down the vinegariness. Meh. Tap at Unorthodox Bar. Very well balanced fruity resiny holpiness and spicy farmhouse character. Rather thin body and high carbonation. Fresh herbal minty feeling. Very tasty, easy drinking, refreshing. Very good. Sampled from tap at 'Be Unorthodox'. Almost clear, pale yellow with a white head. Sweetish, quite fruity, rather funky aroma of gooseberry, elderflower, lemon, hay and some barnyard. Moderately sweet, minimally sourish, quite fruity, gently funky and a bit floral taste of gooseberry, lemon cake, elderflower, some hay and a touch of barnyard, followed by a short, slightly tart, moderately dry, quite funky and gently grassy finish. Almost medium-bodied, smooth and slightly effervescent mouthfeel, soft carbonation. Very interesting stuff! Well-balanced, easily drinkable and still fairly complex for such a beer. Well done! UPDATED: JUL 22, 2018 On tap at Be Unorthodox bar. Pours yellow color, white head. Aroma of yeast, gooseberry. Taste is quite plain, lightly sourish, malty, fruity. Boring.